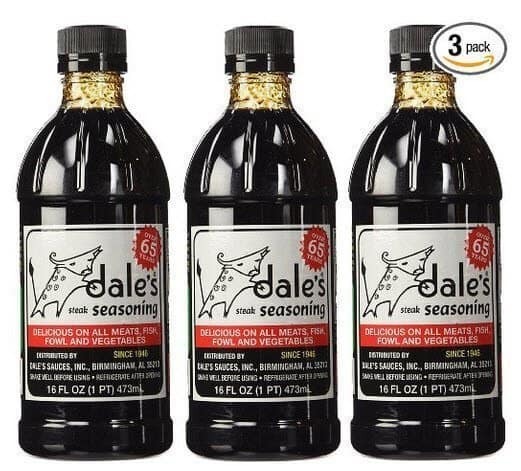 Dale’s, Steak Seasoning is an all-purpose cooking seasoning intended for use with steak, poultry, veggies, and fish. With this pack, you get 3-16 oz bottles of the sauce. Each bottle contains 32-1tbs servings. With a soy sauce base, this dark, liquid seasoning also includes onion, garlic, MSG, ginger, and paprika. While “gluten-free” is listed clearly on the label, the other ingredients may pose some allergy and health concerns. The mix is highly concentrated and according to the manufacturer’s website, you do not need to marinate meat for very long to get a good flavor. It can also be added to food after cooking and does not need to be heated to a certain degree before being consumed. Most often used as a seasoning for grilled meats like pork chops and hamburgers, the soy sauce and ginger suggest that this would also pair well with Asian-inspired dishes like stir-fries and fried rice. Special notes: Shake well and refrigerate after opening. Dale’s Steak sauce is free of gluten but that is about all it is free of. Since it is soy sauce based it obviously has soy and is high in sodium (1,220 mg per tablespoon) It also contains monosodium glutamate (MSG), and corn syrup. That being said, it IS gluten-free and a reasonable alternative for those who often need to avoid soy sauce based seasoning due to the presence of wheat. If you don’t have an allergy to MSG or are not concerned about it, then this is a tasty product that does exactly what it is intended to: add lots of flavor to meat, fish and veggies with minimal effort or marinating time. This is definitely not a health food and does not claim to be, but it is gluten free and made of flavorful components so it will likely please a variety of palates.